(0 Customer Reviews) | Write Review 12 issues per year Beckett Football is a monthly magazine that features values on trading, including new releases. There are also articles on current trends, the latest releases and reviews of just-released products. • The Football Card Price Guide with more than 100 pages filled with values for past current releases. 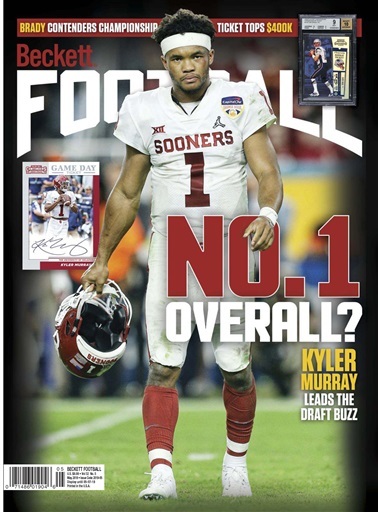 You'll receive 12 issues during a 1 year Beckett Football magazine subscription. Below is a selection of articles in Beckett Football May 2019. 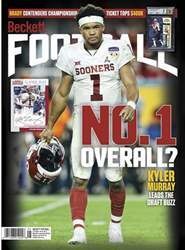 You'll receive 12 issues during a 1 year Beckett Football magazine print subscription.